"Geminder's book showcases an acute sensitivity to worlds both inside and out. There's real delicacy to the craft but underneath all the skill is a shaking sense of purpose, and a great love of the brokenness and beauty of humanity. This is a substantive, memorable debut." 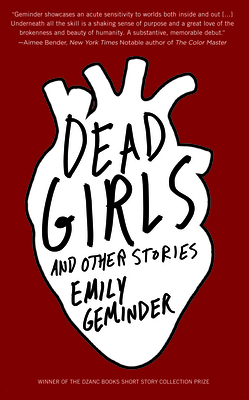 --Aimee Bender, author of The Color Master and The Particular Sadness of Lemon Cake With lyric artistry and emotional force, Emily Geminder's debut collection charts a vivid constellation of characters fleeing their own stories. A teenage runaway and her mute brother seek salvation in houses, buses, the backseats of cars. Preteen girls dial up the ghosts of fat girls. A crew of bomber pilots addresses the sparks of villagers below. In Cambodia, four young women confuse themselves with the ghost of a dead reporter. And from India to New York to Phnom Penh, dead girls both real and fantastic appear again and again: as obsession, as threat, as national myth and collective nightmare.